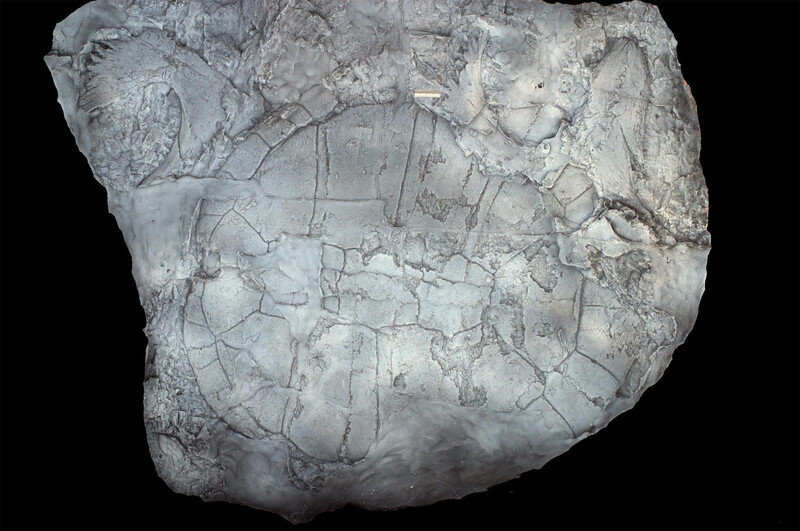 In Arctic Canada, a team of geologists from the University of Rochester has discovered a surprise fossil: a tropical, freshwater, Asian turtle. The find strongly suggests that animals migrated from Asia to North America not around Alaska, as once thought, but directly across a freshwater sea floating atop the warm, salty Arctic Ocean. Published today in the journal Geology, the finding also suggests that a rapid influx of carbon dioxide some 90 million years ago was the likely cause of a super-greenhouse effect that created extraordinary polar heat. "We've known there's been an interchange of animals between Asia and North America in the late Cretaceous period, but this is the first example we have of a fossil in the High Arctic region showing how this migration may have taken place," says John Tarduno, professor of geophysics at the University of Rochester and leader of the Arctic expedition. "We're talking about extremely warm, ice-free conditions in the Arctic region, allowing migrations across the pole." In 2006, Tarduno led an expedition to the Arctic to study paleomagnetism�the Earth's magnetic field in the distant past. Knowing from previous expeditions to the area that the rocks were rich with fossils, Tarduno kept an eye out for them and was rewarded when Stephanie Mason, one of his undergraduate students, uncovered the amazingly well preserved shell of a turtle. Together with collaborator Donald Brinkman of the Royal Tyrrell Museum of Canada, they later named the fossil Aurorachelys, or aurora turtle. The turtle strongly resembles a freshwater Mongolian species, which raised obvious questions about how it came to be in the marine waters of the North American Arctic. Tarduno's paleomagnetic expertise, which allows him to ascertain when points on Earth's crust were at specific locations, allows him to rule out the possibility that millions of years of tectonic activity had brought the fossil from southern climes. The turtle was clearly a native of the area. As to how a freshwater turtle migrated across a salty ocean; Tarduno points to the results of drilling by the Integrated Ocean Drilling Program's ACEX expedition that demonstrated episodes of unusually fresh surface waters in the past Arctic Ocean. Tarduno and his students had been studying massive lava flows that cover some of the High Arctic islands, and believes the same volcanic events that produced those igneous rocks also could have produced a series of islands along a low underwater mountain range in the Arctic Ocean called Alpha Ridge. If the ridge did indeed poke above the surface of the water at one time, it would have given the turtles�and countless other species�the ability to island-hop all the way from ancient Russia to Canada. At the time the aurora turtle lived, the Arctic Ocean was probably even more separated from the global oceanic circulation system than it is today. Numerous rivers from the adjacent continents would have poured fresh water into the ancient Arctic sea. Since fresh water is lighter than marine water, Tarduno thinks it may have rested on top of the salty ocean water, allowing a freshwater animal such as the aurora turtle to migrate with relative ease. Tarduno also believes it's possible that the same volcanic rock may not have allowed only the turtle's migration, but also would have contributed to creating the climate in which the turtle thrived. "We found this turtle right on top of the last flood basalts�a large stretch of lava from a series of giant volcanic eruptions," says Tarduno. "That leads us to believe that the warming may have been caused by volcanoes pumping tremendous amounts of carbon dioxide into the Earth's atmosphere. There's evidence that this volcanic activity happened all around the planet�not just the Arctic. If it all happened on a short enough timescale, it could cause a super-greenhouse effect." He notes that current changes in the recent Arctic climate have affected his field studies. "It is difficult to separate short-term climate trends from a longer-term pattern, but our last few field seasons in the High Arctic have been extraordinarily warm," says Tarduno. "Sometimes students exchange parkas for short-sleeve shirts." Tarduno plans to return to the Arctic to look for places where other fossils might be located. He says the site he's found is incredibly rich, already yielding fossils he and his team are still analyzing. He says he hopes to paint a more complete picture of the time when the Arctic was warm.